I’m ready for a new year. I’ve read your blogs, I can see that most of you are ready too, we are all ready for a new start, new hope, a better tomorrow. 2006 was a full year for us – a move to Kuwait, our son’s wedding to a wonderful young woman, and several trips back to take care of family business. My husband and I looked at each other and laughed – this year we haemmoraged money. We thank God we had the money we needed when we needed it, but the sheer volume of it, going out, stuns us. We hope this will be a better year, a more stable year, as we squirrel around, hiding our nuts for the winter of old age. By the grace of God, my Mom is doing well, and thank all of you who have expressed concerns for her. She is grieving, she misses him so much, but none of us would choose for him to suffer one more minute on this earth when he could be in a better place. She spends her time right now surrounded by family and friends. We know she is going to have some bad moments, but she is amazingly resilient, and we see all sorts of signs that she will do well, once the grief abates. Here is a photo of the photo I told you about earlier in the blog – Dad holding me up so I almost look like I am sitting on the mountain. Those old black and white photos were SO crisp; they enlarged without any serious loss of resolution. I wish you all a great day, tieing up loose ends, and a wonderful new year. Today was my Father’s Memorial service. My Mom chose to invite old friends, relatives, people who knew and loved my father on a boat ride. In the midst of a gloomy, dark wintery week, the morning dawned bright, clear and bright. The sun made everything crisp and clean, if not warm. Our guests arrived, and the boat departed. People spoke of my Dad, and told stories about him – how he had influenced their lives, funny stories from his childhood, things they remembered about him. Then we shared a buffet lunch. The weather held. it was a beautiful day. After the boat ride, the family went back to my sister’s house, where I am staying, where we watched a hysterically funny movie, Kung Fu Hustle, and then went out for Thai food. As we were eating dinner, we got a call – my sister’s daughter had just delivered a baby boy! We celebrated the full circle of life in one day – my father’s passing, a new life, the joy of being all together . . .it’s been a full day. The flight from Amsterdam to Seattle runs around 10 hours – more or less depending on headwinds and tailwinds. Thanks to my almost-fully-flat seat, I was able to get about 6 good hours of sleep, just exactly what I needed to face immigration, customs, car rental and a drive through Seattle (four to five lanes of traffic in both directions) to a northern suburb. It is COLD in Seattle – like the high is about one degree above freezing. It is also a damp cold that makes you shiver, and when the wind blows, it feels freezing. It is supposed to drop down below freezing tonight. I just hope it doesn’t snow again; driving can get problematic in the snow. Grabbed a quick Pepperming Mocha (I don’t know why they don’t do these in Kuwait, but they tell me there would be no market. How do they know? Have they ever tried it?) and headed for my Mom’s. One sister, her husband, and Little Diamond were also waiting for me there, Little Diamond’s sister, Precious Diamond (sometimes called Pregnant Diamond; she is due to have a baby any minute!) and my other sister, her husband and son came by a little later, and we all had dinner together. Mom has asked me to make a kind of photographic tribute to my Dad for the service on Saturday, so we got out all the photo albums, collections, boxes and had a lot of fun going through and remembering all the good times with Dad. I have a stack of photos from different times in his life, and will take them in to get them copied, enlarged, etc somewhere where they can do it FAST. Little Diamond will help with the graphic design and Fonts – she wrote the obituary for the paper and did a truly masterful job. Thanks to the sleep I got on the plane, I was fairly fresh . . . well, I did fall asleep for a while after dinner, but rallied and got another couple hours of work done. I am guessing I will get a good night’s sleep and dive in to all the work that needs to be done tomorrow. With everyone in the family taking a part, it should all work out smoothly. I found the photo of me sitting almost on top of the mountain. I will see if there is a way I can blog it. It is so easy to complain when you live overseas. We complain about Wasta, we complain about corruption – and all it takes is another trip out of Kuwait to see that it exists everywhere. Bureaucracies exist to encourage arbitrary decisions, bribes, and meanness to the customer. But every now and then, you find a brave soul who stands up for right, who uses policy like a rapier against the lazy, and I met one of those this morning. I am connecting in Amsterdam, and I have thousands and thousands of miles I never use. Mostly I have been booking flights on a relatively short term basis, and when your family needs you is not the time to be trying to dicker over free tickets, etc. So as I entered the business lounge, I asked the very nice woman behind the desk if an upgrade was possible for the next leg of the trip. Her fingers flew across the keyboard as she checked this, she double checked that, and then said “you would have to pay 150 Euros to upgrade + 25,000 miles”. Piece of Cake. For a 10 hour flight? 150 Euros! Here’s my money. No no, I had to go downstairs and pay. And downstairs, it is six, when ticketing is supposed to open, but they are very very busy ignoring the customers. They have coffee to get, greetings to exchange, water to distribute, computers to boot – no, no, ticketing open at 6:00 does NOT mean they are ready to serve the customer at six, only that they are in the general area at around six. I don’t usually let things get under my skin, but the sheer blatancy of her desire to get rid of me annoyed me. I said that this was not right, and not fair, and she shrugged her shoulders and smiled. Smiled! Whew! I could almost feel the fire coming out of my ears and eyes! Finally, I signed up for a shower, and washed away all the frustration while the dear lady in the business lounge continued to get people involved. By the time I came back out, fresh and sweet and clean, she gleamed in triumph! “You have your ticket!” she said, her voice triumphant! So downstairs I headed once more to pay. The ticketing lady was totally snippy to me, taking her time, shaking her head in disgust, until I asked her name and wrote it down. Suddenly, she was all sweetness and light, and like magic, my new improved boarding pass appeared. But here is what bugs me. I’ve worked many many jobs that required keeping customers happy. I am really good at it. I take pride in it. In the long run, I believe, good will pays the biggest dividends. And when I can make something good happen for someone, it’s like something good happens for me, too . . . So what possible reason would people in roles where they interface with the public have for being rude? unhelpful? snippy? to take visible joy in saying no? I can imagine that being an airline counter service agent at this time of the year, with all the delays and confusions, and abuse they have to take could be dis-spiriting. I can sympathize that they have to deal with people who all want special treatment. I’m just another person asking for an upgrade. But at the same time, doesn’t it make them feel worse to be rude and unhelpful? Do you deal with the public? Are you ever rude? What pushes your buttons, what can make you rude to a customer? And as a customer, how do you handle a rude employee? My son and his wife married in April, on a beautiful white sand beach in Florida. Between trips back to be with my parents, I made a wedding quilt for them. This pattern is very difficult. All the pieces are curved, and putting them together requires focus and perserverance. Aaaarrrggghhhh! The main fabric is not white – it is a white sand color, with seashells! All the colors are the colors from the beach on that beautiful wedding day. And it was finished just in time for Christmas, alhamdallah! Today I am busy packing for my upcoming trip back for my father’s services, and taking down the Christmas decorations. Why now? I won’t be back until after New Year’s, and I don’t want to have to face it all then. My son and his wife left late last night, and will be meeting up with me again later this week. As soon as they left, I stripped the bed, threw the sheets in the wash, started taking down the tree. My method of coping with grief is to stay busy. But I also have another agenda. And I am going to tell you something that may change your life, as it changed mine. So if you are very very happy with your life right now, stop reading NOW. It’s a Locard Principle kind of thing – if you read this, it will leave a trace on you. OK. You’ve been warned. I have a very good friend, an amazing woman. She was born in Hong Kong, into a wealthy family, and married an American. Not only was he American, but he was in the Navy, and he was a Mormon. So she had to learn three cultures at once – American, Navy/military, and a new religious culture. I tell her I am amazed that she survived; that is a lot of new information and new ways of doing things to do all at once. Who knows why people become friends? All I know is that friends like this, you keep. From the beginning, we were like sisters. For all our differences, we never had a problem making conversation – we both liked investing, and we talked money, real-estate, stocks endlessly. And we had sons the same age who became – and still are – best friends. We settled in the same area, and while I am living in Kuwait, she has visited my parents, called them, and frequently sat with my Dad while he was recouperating from his latest debility. She would take him flowers from her own garden, and magazines, and keep him distracted. She has been a blessing to us all. Several years ago, in one of our conversations, she told me about Chinese New Year. When the New Year comes, your house must be sparkling clean, your bills must all be paid, and you must have money in your pocket, food in the refrigerator, and friends in the house. The way you start your New Year is the way your new year will be. So if you want order and prosperity, you have to be prepared. I’m not Chinese. I’m not superstitious. And what if she’s right? What if the Chinese are right? I make sure all my bills are paid, and I pay a little extra on the mortgage. I make sure we have money in our pockets, and plans with friends that include good food. I’m not Chinese. I am not superstitious. But why take chances? From time to time I think about NOT having everything done by New Year’s, but if I try that, I get too nervous and end up having to do it all on the last day of the year. My friend says you do NOT want to start the New Year cleaning your house! My niece, Little Diamond, writes about The Oldest Mosque in America here. Fourth and fifth generations of Moslems in Iowa! This is my favorite day of the year. I love Christmas Eve Day. We had a dinner last night, here, with good friends. We all worked together to get all the foods prepared, and as we sat at the table, I could see conversations going on, full of lively interest in all the candlelit faces – it was a beautiful moment. It was such a good mixture of people, the food was good (well, maybe I oversalted the rouladen a little) and plentiful, and in spite of the sorrows of the year, we are greatly blessed. We have done all our shopping and wrapping, we will run some errands today – fun ones – and have lunch somewhere, it will be a fun, relaxed day. Tonight we will go to church, to welcome the birth of a tiny, vulnerable baby who made such a difference to so many lives here on earth. So much pain! So much sorry! And one small ray of hope, that in our hearts we can truly love one another, and somehow this sad, troubled world can find the peace for which we all yearn. Today is a day of pure anticipation, of hope, and belief that goodness matters, and that goodness is possible, and that we have redemption. Our holidays of Christmas and Eid al Adha are joined this year. I wish all my brothers and sisters peace, joy, and the blessings of love and family for the coming year. 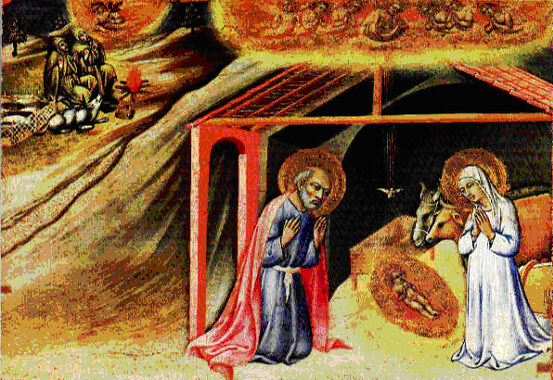 The image is from The Image of Christmas – The Nativity Represented in Art by Dr. Catherine Lawless December 2005. I chose it because Joseph and Mary and the baby look more like Semitics, instead of pale white Europeans. It is by the Sienese painter, Sano di Pietro, painted around 1445 and now in the Pinacoteca Vaticana. “Candy. A term derived from the Arabic qandi, meaning a sugar confection.” That’s in the Oxford Companion to Food. Much much more on candy at Food Timeline. I have never heard that word used for sweets – is it still used?